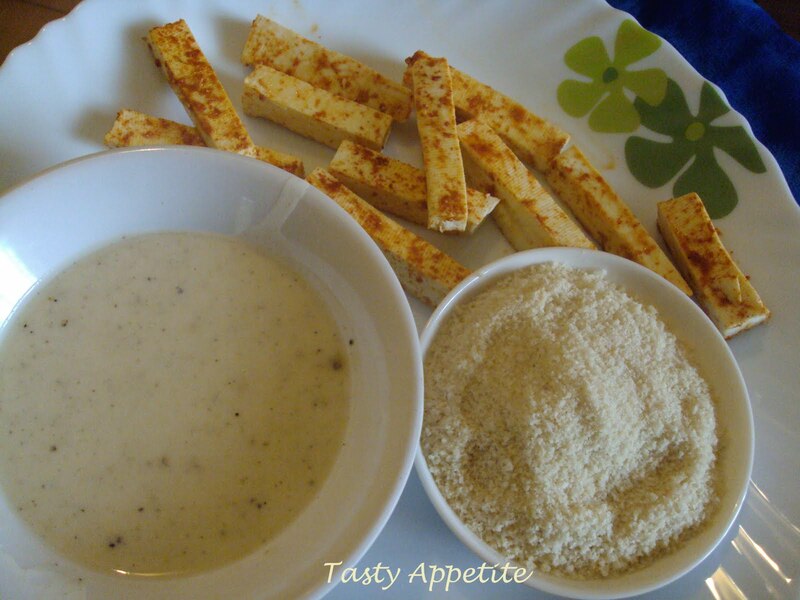 Try this easy and tasty snack ..! 1. Wash and chop paneer to finger size thin slices. 2. Marinate with lemon juice, salt and red chilly pwd. 3. Allow to marinate for 20 minutes. 4. In a small bowl, prepare batter with corn flour, maida, pepper and salt. 5. Add little water to make a thick paste. 7. Heat oil in a fry pan. 8. Take the marinated paneer , coat each individual piece in batter. 9. Then roll it in breadcrumps. 10. 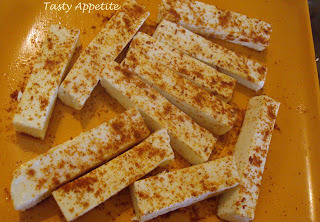 Make the same for all paneer slices and keep it aside. 11. 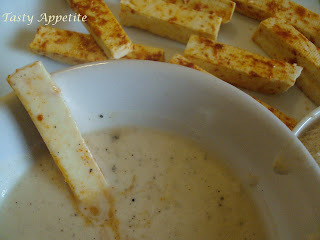 Once the oil is heated, drop the paneer fingers in hot oil and keep the heat in medium flame. 12. Shallow fry gently till it turns golden brown. 13. Drain and keep it in kitchen tissue. 14. Serve hot with tomato ketchup. wow..Crispy finger fry ! !looks very crunchy..wish to grab the whole platter. Creative recipe..crispy and yummy snack. Very tempting and delicious recipe.. looks perfect !! Looks absolutely mouth watering. A sure kid pleaser. 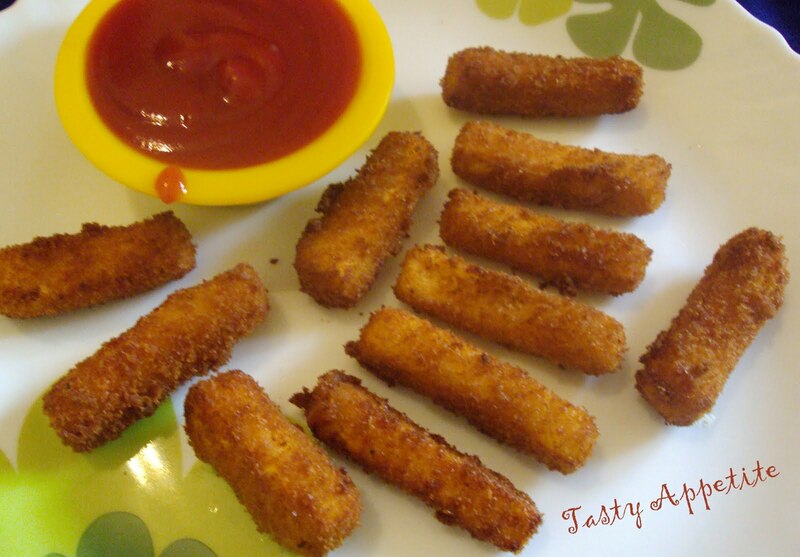 Very addictive and highly tempting paneer fritters..yumm! perfect snack idea for kids!!! great recipe jay! 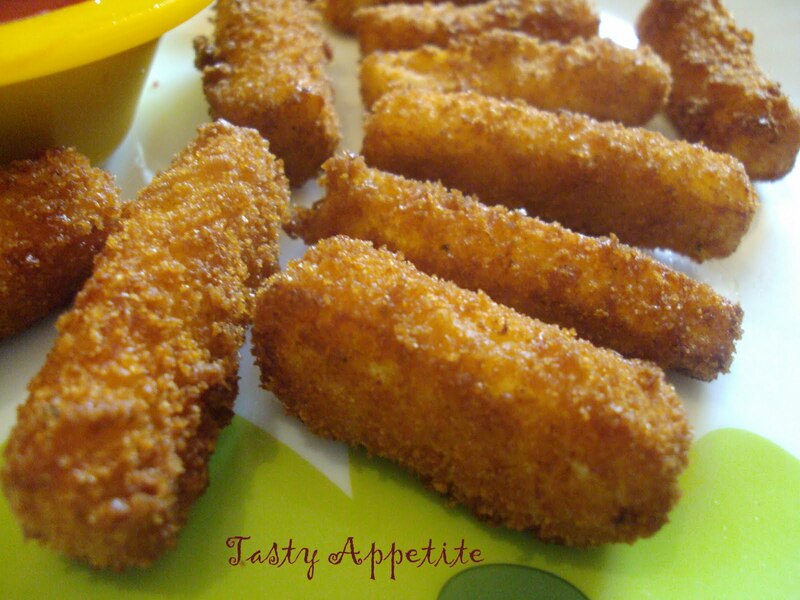 Crispy paneer fingers looks delicious. What a creative way to use paneer! It looks fantastic! Jay, coming right over!! Please make me my own batch of these gorgeous yummies! 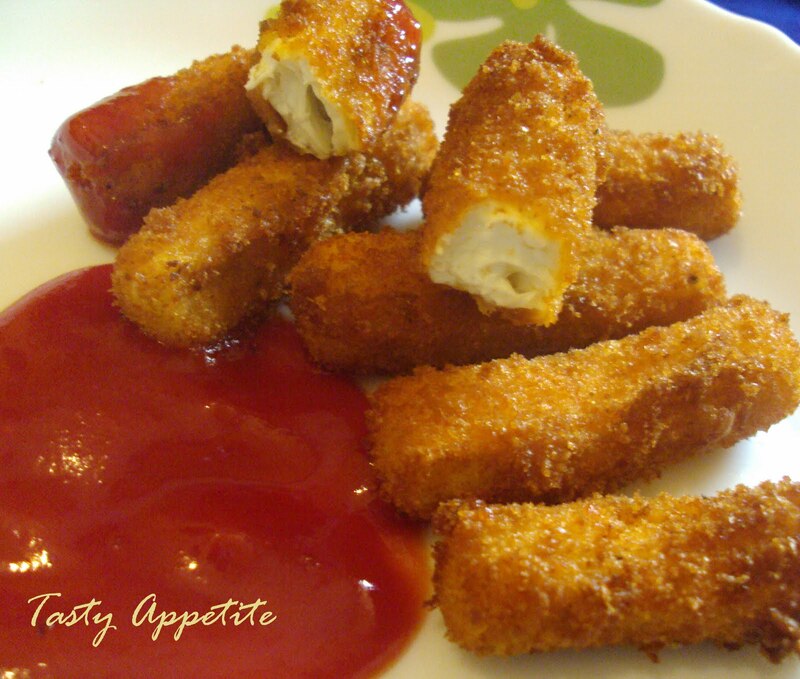 wow...such a tempting paneer fingers...thanks for sharing..
Lovely looking paneer fingers. Must have lasted only a few minutes. lipsmacking indeed !! want to try this soon..looks superb!! 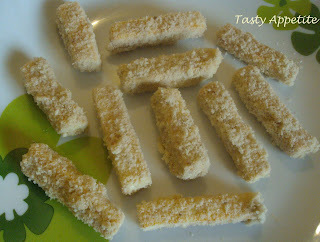 Crispy and tempting..even I can't have enough if this. 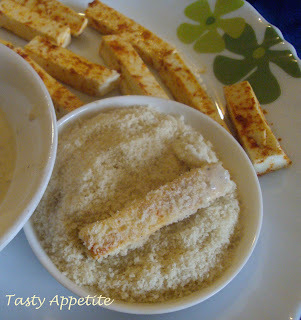 so crispy and wonderful paneer cottage cheese !! I usually buy this ready-made. But this looks fairly easy :) will try it at home. 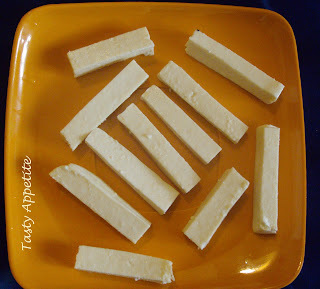 My kids and I are huge fans of finger food but not paneer. Phaps I could try this with chicken? What a great idea Jay! I fancy one or two of those just now. Dunk, dunk! Good Recipe.Will def try...Happy Cooking!!! I also saw this on Yummy Tummy and can't wait to make it for my sisters! I am home,and my wife says she would try it today! These look & sound great, delicious and perfectly done! 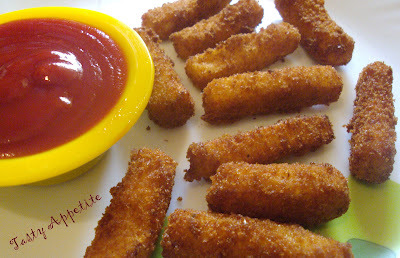 crispy love it.. need all of them..
crispy and yummy fingers. This would ave definetly been a treat to ur kids..
Crispy & irresistible finger paneer. definitely going to try this...your pics make it look irressistible...thanks, jay..
Is self rising flour okay to use instead of the maida? yes, self raising flour can also be used for this recipe..